Hands are wrung. Families cry. Communities mourn. Politicians take to the stage before the world’s media. Like bells ringing across the land, the question is asked: why? Why are British Muslims, in particular, teenagers, schoolgirls, mothers and their children, travelling to Syria to join ISIS? Precisely what is it about the Bethnal Green Academy in Tower Hamlets that makes teenage Muslim girls want to leave their happy homes and do the same? What possessed Talha Asmal, a 17 year old from Dewsbury, to take part in a suicide attack in Iraq? What is it about the three Dawood sisters from Bradford that caused them to leave their husbands and take their nine children en-route from pilgrimage in Saudi Arabia, to Syria, and to live in the so-called ‘Islamic State’? There will be many keen to paint a picture suggesting that Tower Hamlets and Bradford are hot-beds of extremism. There will also be interests looking place the blame at the feet of Islam as a faith, or Muslims as a whole, to blame schools or mosques; communities and families. There will be no shortage of those hungry for grants or media exposure, clambering to feed the prevailing (failed) narrative shared by neoconservatives and whispered into the ears of government, that: there is a conveyor belt to radicalisation; extremism and radicalisation is about bad theology; it is about extremist online preachers; it is about a propensity towards violent jihad and twisted ideology. It is a divisive discourse that we need to define and to separate ‘good’ Muslims who must then take to task the ‘bad’ ones. 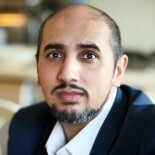 And in that defining of who or what is a good Muslim, the voices being given the largest platforms are the likes of ex-Muslims, neoconservatives and secular progressive faux-reformists. Voices of authenticity, with track records of work with Muslim organisations and communities, have been pushed to the margins. You might think a hawkish pro-militarisation conference looking at countering anti-NATO propaganda and strengthening the NATO-EU alliance, to discuss strategic geopolitical issues including strengthening the EU Schengen zone and defining the borders of ‘real’ Europe, to tackle ISIS and Europeanising Ukraine, is an odd place for the British Prime Minister to send a message to British Muslim communities. You’d be right. Whilst we can recognise the core principle that people and communities do have a responsibility to tackle extremism and not to condone it or provide the cultural milieu; the problem is that on a practical level, extremism is currently defined in reference only to Muslims. It is limited in definition and entirely hypocritical. I have spoken to counter-terrorism officers who in private tell me that domestic far right extremism is a concern but that they are currently being managed to only see ISIS and Muslim-centred issues as a strategic priority. This is a mistake. Extremism comes in many forms. Arguably, it is as much an aggressive foreign policy which targets, attacks and destabilises the Middle East, Africa and Russia as it is the idea that we should let migrants drown in the Mediterranean or scuttle their ships. It is as much domestic far right action and neoconservative policies which usher in white supremacists and Islamophobes into the heart of Whitehall. Unnecessary austerity measures which hurt the poor, vulnerable and needy whilst millionaires are given tax breaks, are certainly not acts of moderation. Despite this, Cameron has his finger firmly pointed towards Muslim communities for the unchallenged radicalisation of Brits who leave to join ISIS. Communities have been at fault for not rooting them out and the evidence is seemingly all around us. We now know that Abase Hussein, the father of one of the girls from Tower Hamlets, attended a flag-burning extremist rally with one of Lee Rigby’s killers. Tick. Khadija, Sugra and Zohra Dawood have travelled with their children to Syria, to join their brother Ahmed Dawood, believed to be fighting with ISIS. Another tick. At first glance, the case seems to be conclusive. However, in my experience, it is not what is being said but rather what is not being said (or in this case not reported loudly) which is where the real story lies. As with many things, we need to look beyond the narrative. Beyond the façade. In light of the huge questions that have been raised by Glenn Greenwald and others about mass surveillance by the state in a post-Snowden world, there has been increasing scrutiny over the actions of GCHQ, Tempora and the gargantuan sums being spent to spy on citizens. Matters concerning the 100% collection of data in the UK, not just meta data, much of which can then be farmed out to the US as their constitutional framework will not allow for it domestically, are hot topics. You’d think the chamber was bursting at the wood-panelled and green leather stitched seems, with politicians desperate to be heard. Well, you can see for yourself. Of those brave few crammed into the session, one was James Brokenshire. Don’t worry if that name is a little hazy. Brokenshire is the man behind the woman, so to speak. As the Home Secretary’s number two, he wrote in reply to my submission to Teresa May, refusing to proscribe the far right fascist anti-Muslim group, the English Defence League. The organisation had been inciting anti-Muslim hate and prejudice, taking part in criminal activity, riots and attacks on police and public alike. The case to proscribe the EDL was overwhelming – they were no less extreme and just as much a menace to society as Al Muhajiroun, a proscribed organisation. Documentary evidence had now been disclosed from the Breivik trial that the EDL had been meeting with the mass murdering terrorist, sharing information and ideology with him, and the two had been working together directly. It really should have been a slam-dunk under the Terrorism Act. 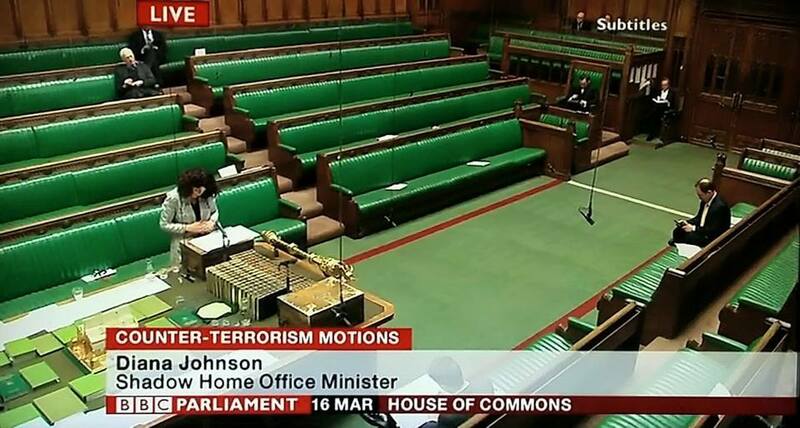 Another attendee for counter-terrorism motions that day was Keith Vaz, Chairman of the Home Affairs Select Committee. A week before the Commons session, Vaz took evidence from a number of families from Tower Hamlets and their lawyer, about why their teenage daughters had left to join ISIS. The story had received wall-to-wall coverage in the UK. The front pages of our newspapers were hysterical with the Muslim schoolgirls who became terrorists. It was a feeding frenzy. At an event in London recently, I met with Tasnime Akunjee, the solicitor for the Tower Hamlets families, and we discussed what had gone on. Tasnime was clear about the causes of this situation. It was not rogue or extremist parenting, online radicalisation, nor a broken and discredited ‘conveyor belt’ to extremism theory, which was the root cause of the girls going to Syria. When Tasnime and the families came to Parliament to give evidence before the select committee and Vaz, they made a number of shocking allegations which have subsequently been almost entirely ignored by the mainstream media. Truths don’t come much more inconvenient than this. Their evidence was that their daughters had become radicalised at the school gate; through interactions and meetings at school with British police and counter-terrorism officers, with PREVENT officers and potentially, it would be safe to assume in light of later events, foreign intelligence agents. They explained to Vaz how their daughters were ordered to keep these interactions secret – to not tell their mothers and fathers; how letters were handed to the girls to scare and, in the words of one of the fathers, “terrorise” and agitate the girls. Again they were ordered to keep it private from their parents and communities. Vaz was told how the school, police and security services had known that a girl had previously joined ISIS from that same school and cohort of girls, just two months earlier in Dec 2014. At that time they were all told to keep it from their parents. The families told Vaz how the parents were being blamed by the media and police about their daughters joining ISIS whilst the police (and now we know also western intelligence agencies) had been actively complicit all along. Tasnime complained to Vaz that the PREVENT officer had quite scandalously told the families to ignore the advice from him, their legal representative. You might be wondering how Tasmine found out. The PREVENT officer had telephoned the families to undermine their lawyer. Tasnime was sat with the families in their lounge as the call came in and they promptly handed the phone to him. We can only imagine the conversation that ensued. Peversely impressive about the Parliamentary session, was that Vaz, having just met the families and heard their testimony, gave a meandering, filibustering summary of the Tower Hamlets school girls yet miraculously managed to skate entirely around any matter critical of government or western intelligence agencies, including the arrest of the Canadian intelligence officer in Turkey who had facilitated the three girls going out to Syria to join ISIS. It takes a remarkable level of skill to keep Hansard clean of such inconveniences. As the Prime Minister said in his speech on Friday, it is wrong and dangerous to play the blame-game, and to argue that radicalisation is the fault of someone else. Pointing the finger at the authorities or agencies ignores the real causes of radicalisation and how we can work together to tackle it. It appears that pointing the finger at innocent Muslim communities is altogether acceptable. The methodology is simple but affective. Agitate. Put pressure on individuals. Threaten them. Put the squeeze on them. Swear them to secrecy. Get between them and their communities and their families. Make them break. Then all that is needed, is to facilitate their transit to Syria – either by working with other foreign intelligence assets, or by putting them in touch with people out in the region already. It really is a sickening hypocrisy playing out before us. The innocent are accused. The complicit excused. These are huge questions but no one dares to ask. No one is answering. It is a complete conspiracy of silence. Western intelligence agencies agitate, radicalise and then support British citizens – mothers, school children and teenagers – to leave Britain to travel to Syria and join ISIS. Undoubtedly, the causes for radicalisation and disaffection are complex and multifarious: poverty, lack of religious literacy, marginalisation, foreign policy. There has been multi-generational alienation from society and decades of under-investment. Discrimination, intolerance and mistreatment is now at epidemic levels. Yes, there are real fighters leaving Europe to join the jihad in Syria. I have condemned that. I do again. But that our own agencies have been the direct cause of people going out to that region, which is playing out, falsely, in the media, is a case which needs to be answered. Amidst all this, we have our politicians green-lighting far right extremism, our political system has become infected with anti-Muslim extremists and our political class and media is all but turning a blind eye to the reality – that we are up to our necks in it. The families have little recourse. The conspiracy of silence is deafening. As for Vaz, he has just been resoundingly re-elected as Chairman of the Home Affairs Select Committee. He trounced poor Fiona MacTaggart in the secret ballot: 412 votes to 192. This entry was posted on 30/03/2015 by Mo Ansar in Media, Religion, UK Politics, World Politics and tagged Bradford families, Cameron, Extremism, ISIS, Islam, Islamism, NATO, Syria.